Celebrate Mexico's Day of the Dead. 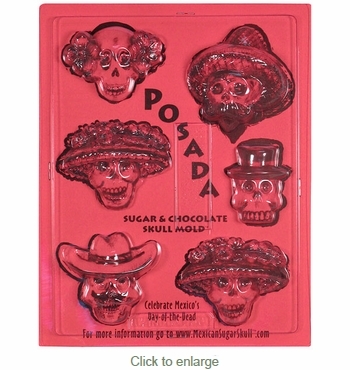 These Posada chocolate skull molds are perfect for your Dia de los Muertos display and celebration. These molds can also be cast with Plaster of Paris, melted soap or used to make colored ice skulls. Variety of Styles: If ordering quantities of 2 or more sets and you would like a variety of molds, tell us in the comments section at checkout which molds (item numbers) and how many of each to fill your order. Each set includes: 1 mold to make 6 posada skulls and instructions.